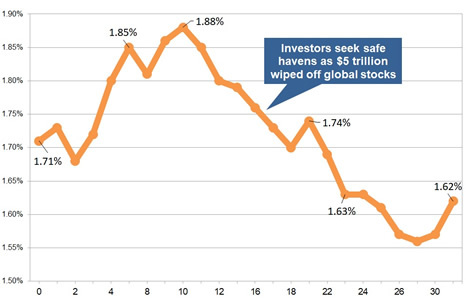 The 15-year gilt yields decreased 9 basis points as investors seek the safety of bonds and gilts with $5 trillion wiped off the value of global equities. The 15-year gilt yields rise during the month as there was an expectation of the Federal Reserve continuing their policy to increase interest rates in the US to counter a rise in inflation. The 15-year gilt yield decreased by 9 basis points to 1.62% during October 2018 with providers of standard annuities increasing rates by an average 0.59% for this month and we would expect rates to fall by -1.49% in the short term if yields do not fall. 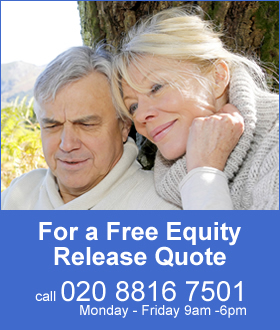 For smoker and enhanced annuity providers have increased their rates by an average of 0.59% and rates may rise by -1.64% in the short term if yields do not fall. 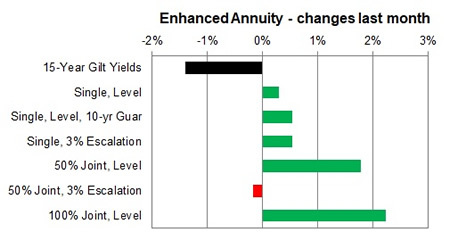 For the month 65% of annuity rates increased by up to 7.1% with 23% remaining unchanged and 12% decreasing by up to -1.2%. 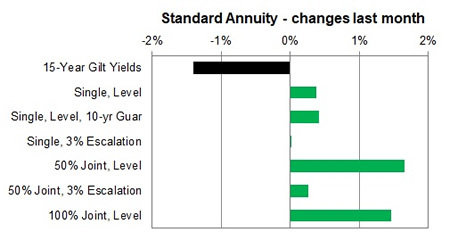 Standard annuities increased by 0.59% during the month. The largest rise was for those aged 65 based on a 50% joint life with 3% escalation up by 1.4% for the month with the largest decrease for those aged 55 on a 50% joint life with 3% escalation basis down -1.2%. For enhanced and smoker the majority of rates increased by 0.74% for the month on average. The largest rise was for those aged 70 based on a 100% joint life level basis up 7.0% for the month with the largest decrease for those aged 55 50% joint life with 3% escalation basis down -1.1%.